Book News: Salman Rushdie Wins PEN/Pinter Prize For 'Unflinching' Gaze : The Two-Way Also: an excerpt from Marilynne Robinson's next novel; the problem of translating Proust. Author Salman Rushdie, seen in January 2013, was also lauded by the judges for "his countless private acts of kindness." Salman Rushdie, novelist and target of a fatwa that forced him into hiding for years, has won the 2014 PEN/Pinter Prize. The award is given every year to a British writer who, in the words of Harold Pinter, has an "unflinching, unswerving" gaze and "fierce intellectual determination ... to define the real truth of our lives and our societies." The prize will be presented at a ceremony in October. 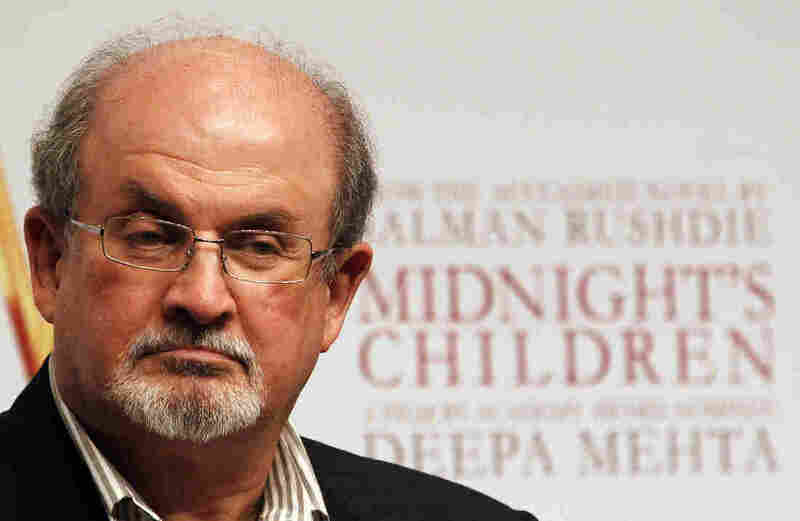 The head of the judges, Maureen Freely, said in PEN's announcement, "This prize is English PEN's way of thanking Salman Rushdie not just for his books and his many years of speaking out for freedom of expression, but also for his countless private acts of kindness. When he sees writers unjustly vilified, prosecuted, or forced into exile, he takes a personal interest." The prize will be shared between Rushdie and a persecuted writer who has been targeted for their beliefs. This "international writer of courage" will be selected by Rushdie and English PEN. Farrar, Straus & Giroux's Work in Progress blog has an excerpt from Marilynne Robinson's next novel, Lila, set in the world of her Pulitzer-winning book Gilead: "The child was just there on the stoop in the dark, hugging herself against the cold, all cried out and nearly sleeping. She couldn't holler any more and they didn't hear her anyway, or they might and that would make things worse." Colum McCann talks about his favorite writers: "[F]or me, James Joyce is the original energy behind all contemporary literature." An essay in the Boston Review looks at the problem of translating Proust: "There is always a tension in translation between the spirit and the letter, between conveying things we might call tone, mood, feel, or music, and being as literally faithful to the original as possible." Emily Schultz, author of a novel called Joyland — which has the same title as Stephen King's recent book — writes about spending the "Stephen King money," royalties she got from people buying her book by mistake. On her blog, she lists the ways she used the money and analyzes whether Stephen King would like it (on repairing a bumper on her car that was possibly damaged by garbage workers, she writes, "Cars, mysterious garbagemen, feelings of vengeance — of course he would!") King told Entertainment Weekly that "I'm delighted for her, and I'm going to order her book."